Vamoose Bus – Announcements and press releases from Vamoose Bus. Travelers to New York City can book tickets to the city’s top sightseeing tours and attractions. New York City, January 2, 2019 – Vamoose Bus, an intercity bus company between the New York City and the Washington, DC area, is pleased to announce a new partnership with vamzio.com. Vamzio is a state-of-the-art online booking platform, where travelers visiting New York City can browse and book tickets to top sightseeing tours, fun activities, and cultural attractions in the Big Apple. Vamzio’s user-friendly platform features a variety of tours and activities, from movie-themed tours to food tours, virtual reality activities and beyond. Tourists seeking information about tickets for sightseeing and activities in New York City, visit vamzio.com. Headquartered in Manhattan, Vamoose Bus moves over 7,000 travelers a week between New York City and several cities in suburban Washington, DC. Launched in 2004, Vamoose Bus has built a reputation for dependable on-time departures and arrivals, convenient pick-up and drop-off locations, cost-effective travel fares, and especially, a safe travel experience. Vamoose Bus was awarded “Best Bus to NYC” by Washingtonian Magazine in 2015. Early booking data predicts a robust increase in travel activity for Inauguration weekend, particularly for the Women’s march. New York, November 30, 2016 – Vamoose Bus, the intercity bus company serving NYC and the DC area, estimates that travel activity in the New York City – Washington, DC corridor is expected to reach an unprecedented high-peak on the third weekend of January 2017, due to the inauguration of President-elect Donald J. Trump and the Women’s March on Washington, which will be held back to back on Friday, January 20th and Saturday, January 21st respectively. According to Mr. Lastres’ observation of the exceptionally high number of early bookings, travel activity in DC for inauguration weekend could equal, or even exceed, other traditional travel peaks, such as Thanksgiving and July 4. He added that Vamoose Bus is monitoring the flow of bookings, and they will continue to be expanding the bus schedules in order to accommodate the stream of travelers who are heading to D.C. for the historical events. Vamoose Bus, a family-owned intercity bus company headquartered in NYC, operates daily buses between Midtown Manhattan and several cities in the Washington, DC metropolitan area. The bus stops are conveniently located at Penn Station in New York City; Bethesda Metro station in Bethesda, MD; Rosslyn Metro station in Arlington, VA; and Lorton VRE station in Lorton, VA.
Vamoose Bus has built a reputation for dependable on-time departures and arrivals, convenient pick-up and drop-off locations, cost effective travel fares, and especially, a safe travel experience. Vamoose Bus was awarded “Best Bus to NYC” by Washingtonian Magazine in 2015. 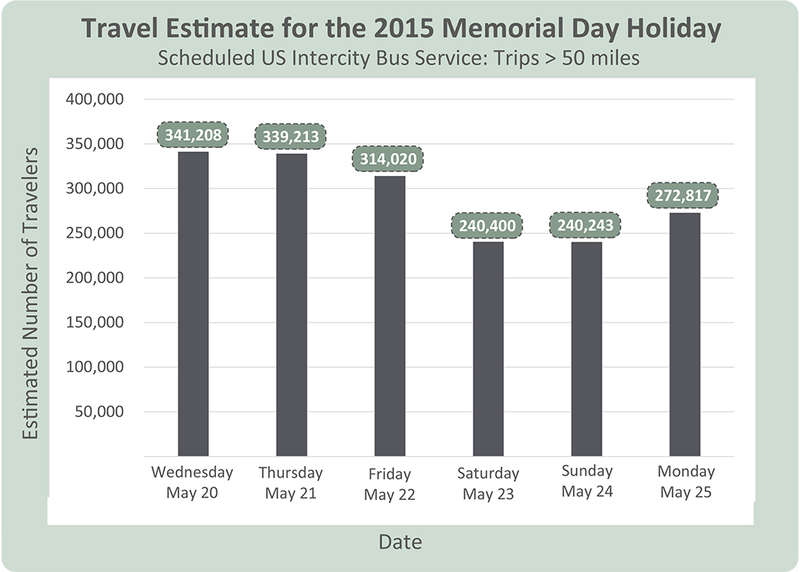 A new research report shows that the intercity bus industry is expected to see highest Memorial Day weekend ridership in 25 years, according to the American Bus Association. The report, conducted by DePaul University’s Chaddick Institute for Metropolitan Development with support from Vamoose Bus affiliate Wanderu.com, forecasts that as many as 1.8 million traveler will ride on motorcoaches in scheduled service this Memorial Day, up 5% over 2014. New service will assist small and mid-sized groups with their local transportation needs in The Big Apple. New York, NY (May 1, 2015) – Vamoose Bus, a leading provider of intercity bus service in the NYC and metro Washington, DC area, launched a new upscale sprinter-van limo service in New York City. The sprinter-van service will provide small and mid-sized corporate, church, family and school groups with shuttle service to/from NYC area airports, conventions, hotels, and events. Vamoose Bus will also offer local hourly tours, as well as charter transportation to any venue in the NYC metro area. To request a group quote, call 212-695-6766, or visit us on the web http://VamooseBus.com. Vamoose Bus is a family-owned bus company headquartered in Manhattan, and its principals have more than 35 years of experience in the passenger transportation industry. Launched in 2004, the company’s primary focus is to offer travelers a safe, reliable and affordable travel experience, with a special emphasis on customer service. Carrying an average of more than 6,500 passengers a week, Vamoose Bus has developed a solid reputation among travelers in the NYC and Washington, DC metro area, who recognize the company’s devotion to customer service, and many of whom ride the service on a weekly basis. In addition to our main intercity bus service, we also offer the luxury Vamoose Gold Bus service, a niche in the bus industry; Vamoose Bus Rewards, a rewards program for frequent-travelers; luggage-storage service at our NYC bus stop; and the newly launched sprinter-van service in NYC. For more information on all Vamoose Bus services, visit our website http://VamooseBus.com. For company news and updates, follow us on social media http://twitter.com/VamooseBus, http://facebook.com/VamooseBus and http://Instagram.com/VamooseBus. New luggage storage service will offer Vamoose Bus travelers to New York City a convenient option to store their bags while spending the day in the city. New York, NY (August 30, 2013) – Vamoose Bus, the popular express bus service between New York City and the Washington, DC suburbs, introduced their newest service to its customers: Same-Day Luggage Storage Service. This new service, offered at the Vamoose Bus office in Midtown Manhattan, allows Vamoose passengers to conveniently store their luggage while spending the day in the city. “Our passengers will now have the flexibility of checking out of their hotel rooms in the morning, and can enjoy a full day in the city without schlepping along their bags,” said Sam Bluzenstein, president of Vamoose Bus. The luggage storage service is offered at the Vamoose Bus office in New York City; no advance reservation is required. The fee for this service is $5.00 per piece of luggage. Vamoose Bus, a family-owned, intercity bus company launched in 2004, transports more than 6,000 travelers a week between New York City and the Washington, DC suburbs. The NYC stop is located one block from Penn Station, in the heart of Midtown Manhattan. The DC area stops are located in Bethesda, MD; Arlington (Rosslyn), VA and Lorton, VA. Vamoose Bus service operates daily. Vamoose Bus is known for its superb customer service, flexible ticket-change policy, luggage assistance at the bus, and attractive frequent-traveler rewards program. Visit us at VamooseBus.com and join @VamooseBus on Facebook & Twitter. Bethesda, MD (April 14, 2011) – Vamoose Bus, the popular, express bus service between New York City and Bethesda, MD, will be donating 4 round trip tickets daily to families and friends of patients presently staying at the National Institutes of Health (NIH) Clinical Center. The program will outreach to Children’s Inn at NIH, Edmond J. Safra Family Lodge, Friends of the Clinical Center, and Special Love, Inc.
Randy Schools, President of NIH Recreation and Welfare Assocation announced the commencement of this new service on April 8, 2011. Priority will be given on financial need. Arrangements for travel must be made by contacting Kallie Wasserman, Tel: (301) 496-6061, Fax: (301) 402-1052, Email: wassermankt@mail.nih.gov. New location will provide a convenient travel option to New York City for the people of southern Fairfax County and surrounding areas. New York, NY (December 23, 2010) – Vamoose Bus, the popular, express bus service between New York City and the Washington, DC Metropolitan area, will expand its high-quality bus service to Lorton, VA., on January 5, 2011. Vamoose Bus will offer multiple daily departures between the Virginia Railway Express (VRE) Lorton Station in southern Fairfax County, and the company’s New York City bus stop, located at the corner of West 30th Street and 7th Avenue, (Penn Station) in the heart of Midtown Manhattan. Customers may begin booking travel today at VamooseBus.com for January 5, 2011 and beyond. With the addition of Lorton, VA, Vamoose Bus will now serve 3 cities from the company’s main hub in New York City. Vamoose Bus, launched in February 2004, is currently carrying more than 5,000 travelers a week. In addition to convenient pickup locations, Vamoose Bus is known for its superb customer service, flexible booking policy, and an attractive frequent-traveler rewards program. Vamoose Bus, a family-owned, intercity bus company, transports more than 5,000 travelers a week between New York City and the Washington, DC Metropolitan area. The NYC stop is situated 1 block from Penn Station, in the heart of Midtown Manhattan. The Washington, DC Metro area stops are located in Bethesda, MD; Arlington, VA (Rosslyn) and Lorton, VA. Vamoose Bus service operates daily. Visit us at VamooseBus.com and join @VamooseBus on Facebook &Twitter.